Happy Spring everybody! Winter is almost over 🙁 We love winter! Snow, the holidays and watching movies by the fire, winter might be our favorite time of the year! All good things must come to an end, but with the coming of spring you get sunny days, playing outside and of course SPRING CLEANING! Spring Cleaning isn’t something very many people look forward to (Nana being the one exception we can think of). It can be really annoying figuring out where to start and keeping track of what you need to do. 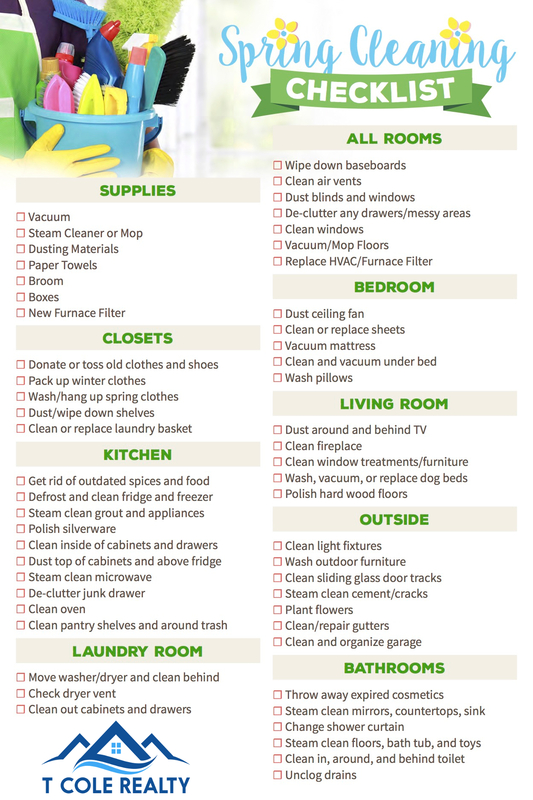 We have provided below a check list of suggestions for Spring Cleaning, let us know if you have any additions! That’s it for now, time to get to cleaning! As always, we appreciate your referrals! Previous What should I do with my tax refund?